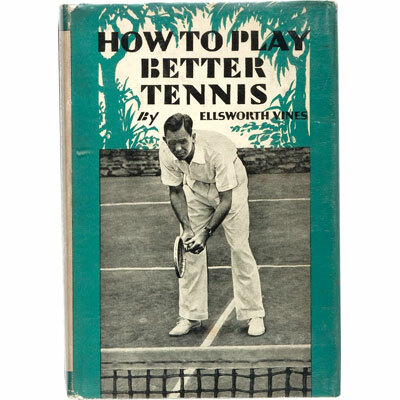 How to Play Better Tennis - Ellsworth Vines Circa 1950 - Bell Publishing Company, Duxel Hill - Early reprint in scarce jacket [first published 1938]	When he was at the height of his powers in the 1930s, serving prodigiously and striking the ball with awesome power off the ground, Vines was nearly invincible on his best days. An overwhelming force on grass courts, he won two U.S. Championships in singles and once ruled at Wimbledon in the early 1930s. Turning professional at 22, he went on to topple Bill Tilden, 47 matches to 26, in a 1934 head-to-head tour, and then eclipsed Don Budge, 49 matches to 35, following up in 1938 by beating Fred Perry 49 times to 35 in another tour. New York Times Obituary - Ellsworth Vines [1911-94], a lanky, big-serving Californian who won the national tennis championship twice and Wimbledon once in the 1930's and has been revered ever since as one of the game's greatest players. That rare combination, a precision power player who not only aimed for the corners but hit them often enough with such blistering force that there are those who still maintain tennis has yet to see his equal. His 6-4, 6-2, 6-0 victory over Bunny Austin in 1932 was called the era's most overwhelming mastery of an opponent in a Wimbledon final, and his five-set loss to Jack Crawford the next year was hailed as Wimbledon's greatest match. Even those who would rank Bill Tilden or other players higher would not dispute the widely accepted notion that Vines, in long pants with his little wooden racket, served and stroked as hard as anyone before or since. The ultimate tribute came at Wimbledon in 1932 when Vines closed out the championship match with an ace of such blinding speed that the hapless Austin said he had no idea whether the ball had passed to his left or his right. What set Vines apart from other power players was his versatility and his accuracy. His forehand was as feared as his serve, and although known as a serve-and-volley player, he was often a serve-and-serve player. He generally averaged two aces per four-point game and would regularly rip off four in a row, as he did in the 1932 Wimbledon final, scoring 30 aces in 12 service games for a 2.5 average. For all his overpowering skill, much of the excitement Vines created on the court came from his come-from-behind charges. In the typical Vines match he would lose the first two sets and come within a point of defeat in the third before staging an incredible comeback. Sometimes, of course, he would lose, usually to himself. His all-or-nothing style left no margin for error. When his game was on it was close to perfect. When it was off, it was gone. Although he was a natural athlete of finely tuned balance and power, hebrought more than innate ability to the court. His game was honed by one of the sport's most acclaimed coaches, Mercer Beasley. Beasley, who became his coach when Vines was 15, flattened his serve and forehand into the rifle shots they became and used ingenuity in developing his fabled accuracy. A narrow strip of canvas with cutouts would be stretched across the top of the net, and Vines would spend hours drilling balls through the holes. Vines came East for the first time in July 1930 and promptly beat two of the game's biggest guns, Frank Hunter and Frank Shields. By the time he beat them both again a week later, he was being hailed as the second coming of William Tatem Tilden 2d.